Background: To demonstrate the capability of laparoscopic and small-incision in management of acute cholangitis and other complications of cholelithiasis. Material and methods: Records of 2973 patients who underwent cholecystectomy at Department of General Surgery, Rostov State Medical University between the year 2004 and 2007 were reviewed. 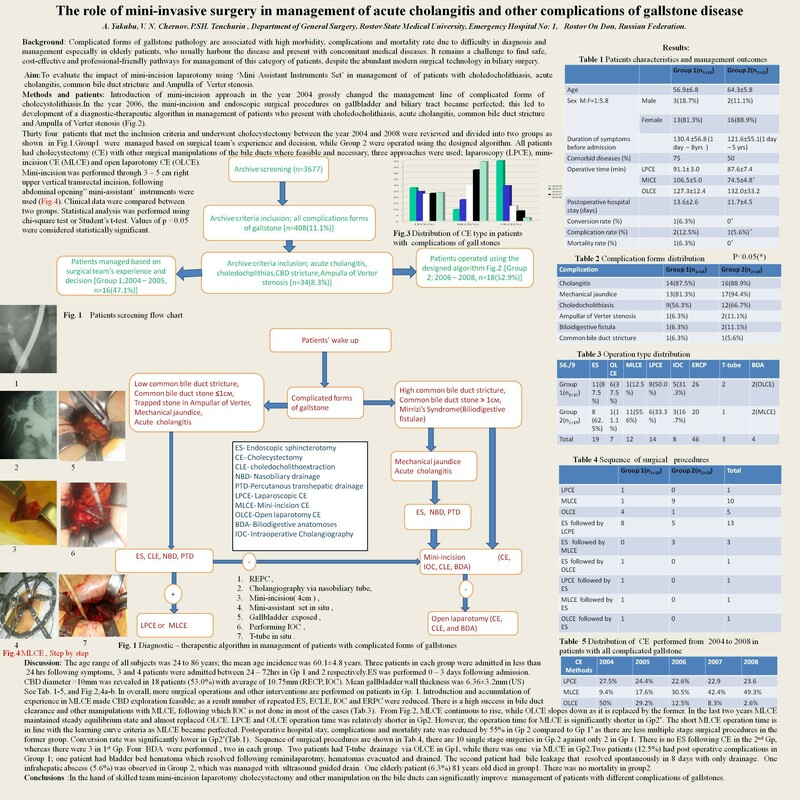 Three hundred ninety two cases of gallstone-related complications were evaluated retroprospectively and divided into three groups. Group1; LC included 258(65.8%) patients with laparoscopy cholecystectomy. Group 2; MC included 84(21.4%) patients with minilaparotomy cholecystectomy, while Group 3; OC included 50(12.8%) patients with conventional open cholecystectomy. Demographic information, clinical characteristics, types of surgery, operation time, postoperative hospital stay, complications, conversion rate and postoperative mortality were evaluated. pericholecystic fibrotic mass in 4(14.8%) and empyema in 3 (11.1%). Twenty three (85.2%) subjects had three and more of such combinations. Seventeen patients (63.0%) were associated with concomitant diseases. The average duration of surgery in LC was 72 ± 9 minutes and 55 ± 2 minutes in MC group. Hospital days were comparatively less in the LC group, 11.4±0 .6 days as against 16.3± 2.3 for MC group. The median length of hospital stay following LC and MC was 7 and 10 days respectively.